Quoted from Sri Chaitanya Charitamrita. A landholder named Ramachandra Khan was the zamindar of that district. He was envious of Vaisnavas and was therefore a great atheist. Unable to tolerate that such respect was being offered to Haridasa Thakura, Ramachandra Khan planned in various ways to dishonor him. After leaving his home, Haridasa Thakura stayed for some time in the forest of Benapola. Haridasa Thakura constructed a cottage in a solitary forest. There he planted a tulasi plant, and in front of the tulasi he would chant the holy name of the Lord 300,000 times daily. He chanted throughout the entire day and night. For his bodily maintenance he would go to a brahmana’s house and beg some food. He was spiritually so influential that all the neighboring people worshiped him. A landholder named Ramachandra Khan was the zamindar of that district. He was envious of Vaisnavas and was therefore a great atheist. Unable to tolerate that such respect was being offered to Haridasa Thakura, Ramachandra Khan planned in various ways to dishonor him. By no means could he find any fault in the character of Haridasa Thakura. Therefore he called for local prostitutes and began a plan to discredit His Holiness. The prostitute returned to Ramachandra Khan and informed him of what had happened. The next day she came earlier, at the beginning of the evening, and stayed with Haridasa Thakura. After offering obeisances to the tulasi plant and Haridasa Thakura, she sat down on the threshold of the room. Thus she began to hear Haridasa Thakura’s chanting, and she also personally chanted “Hari, Hari,” the holy name of the Lord. “Today it will be possible for me to finish my chanting,” Haridasa Thakura informed her. “Then I shall satisfy all your desires.” The night ended while Haridasa Thakura was chanting, but by his association the mind of the prostitute had changed. After thus instructing the prostitute about the process of chanting the Hare Krsna mantra, Haridasa Thakura stood up and left, continuously chanting “Hari, Hari.” Thereafter, the prostitute distributed to the brahmanas whatever household possessions she had, following the order of her spiritual master. The prostitute shaved her head clean in accordance with Vaisnava principles and stayed in that room wearing only one cloth. Following in the footsteps of her spiritual master, she began chanting the Hare Krsna maha-mantra 300,000 times a day. She chanted throughout the entire day and night. She worshiped the tulasi plant, following in the footsteps of her spiritual master. Instead of eating regularly, she chewed whatever food she received as alms, and if nothing was supplied she would fast. 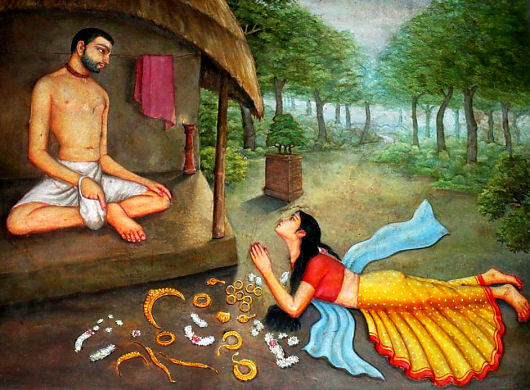 Thus by eating frugally and fasting she conquered her senses, and as soon as her senses were controlled, symptoms of love of Godhead appeared in her person. Thus the prostitute became a celebrated devotee. She became very advanced in spiritual life, and many stalwart Vaisnavas would come to see her. Seeing the sublime character of the prostitute, everyone was astonished. Everyone glorified the influence of Haridasa Thakura and offered him obeisances. By inducing a prostitute to disturb Haridasa Thakura, Ramachandra Khan caused a seed of offense at his lotus feet to germinate. This seed later became a tree, and when it fructified, Ramachandra Khan ate its fruits. Ramachandra Khan was naturally a nondevotee. Now, having offended the lotus feet of Haridasa Thakura, he became just like a demoniac atheist. Because of blaspheming the cult of Vaisnavism and insulting the devotees for a long time, he now received the results of his offensive activities. When Nityananda Prabhu heard this order from the servant of Ramachandra Khan, He became very angry and came out. Laughing very loudly, He spoke as follows. “Ramachandra Khan has spoken rightly. This place is unfit for Me. It is fit for cow-killing meateaters.” Having said this, Lord Nityananda stood up and left in an angry mood. To chastise Ramachandra Khan, He did not even stay in that village. Ramachandra Khan ordered the servant to dig up the dirt in the place where Nityananda Prabhu had sat. To purify the Durga-mandapa temple and the courtyard, Ramachandra Khan sprinkled and smeared it with water mixed with cow dung, but still his mind was unsatisfied. Ramachandra Khan’s business was questionable, for he tried to avoid paying income tax to the government. Therefore the government’s minister of finance was angry and came to his residence. The Mohammedan minister made his residence in the Durga-mandapa of Ramachandra Khan. He killed a cow and cooked the meat at that very place. He arrested Ramachandra Khan, along with his wife and sons, and then he continuously plundered the house and village for three days. In that very room he cooked the flesh of a cow for three consecutive days. Then the next day he left, accompanied by his followers. The Mohammedan minister took away Ramachandra Khan’s position, wealth and followers. For many days the village remained deserted. Wherever an advanced devotee is insulted, for one man’s fault the entire town or place is afflicted.